This show will showcase the inspirational and healing alignment processes as well as the alternative holistic reinterpretations of mental and emotional issues as defined in Step Two of Dr. Kemp's book: From Psychotherapy to Sacretherapy® - Alternative Holistic Descriptions & Healing Processes for 170 Mental & Emotional Diagnoses Worldwide. This show will also explain her rationale for the reclassification and new meaning for diagnoses as well as answer questions from readers regarding some of the diagnoses such as the reinterpretation of post partum depression and sexual problems and others. This leading edge perspective has already brought many people tremendous relief. View testimonies of others at www.drameliakemp.com (click the Testimonies link). You are also invited to call in during the show to ask a question or make a comment. 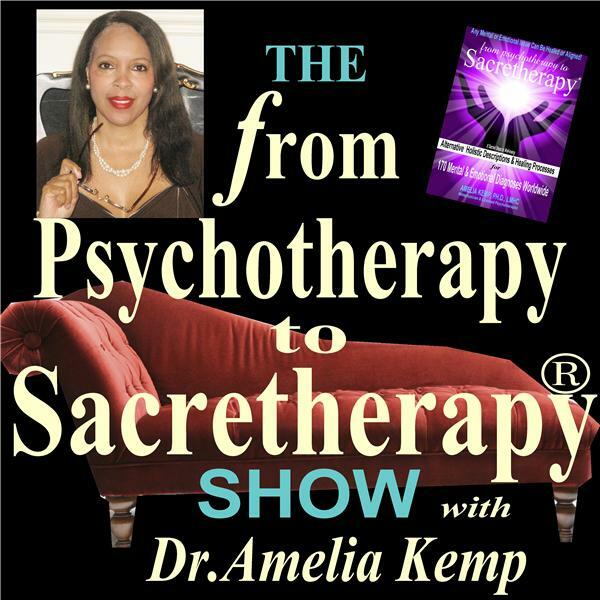 Or you may send a question about the holistic and alternative healing offered in the book or a particular mental or emotional diagnoses that you or a loved one may have, and Dr. Kemp will offer her re-interpretation of it for you from the Sacretherapy® perspective from her book right here on the show. The number to call is 1-347-677-0795 or use the form at www.DrAmeliaKemp.com by clicking the radio show link. While there, sign up for the weekly podcast and get a free relaxation and meditation cd by Dr. Kemp.